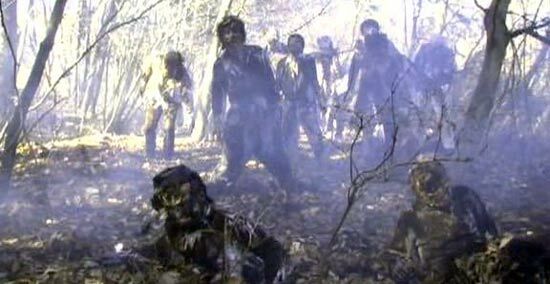 Now that's how you do a zombie film if you've little to no budget and little to no restraint. Forget keeping things sane or simple; the one thing clear from the batshit crazy opening from director Naoyuki Tomomatsu's zombie opus, is we're in for quite the ride. You see, some aliens have crash landed their ufo in the forest at the foot of Mount Fuji throwing out green radiation which has reanimated the dead. 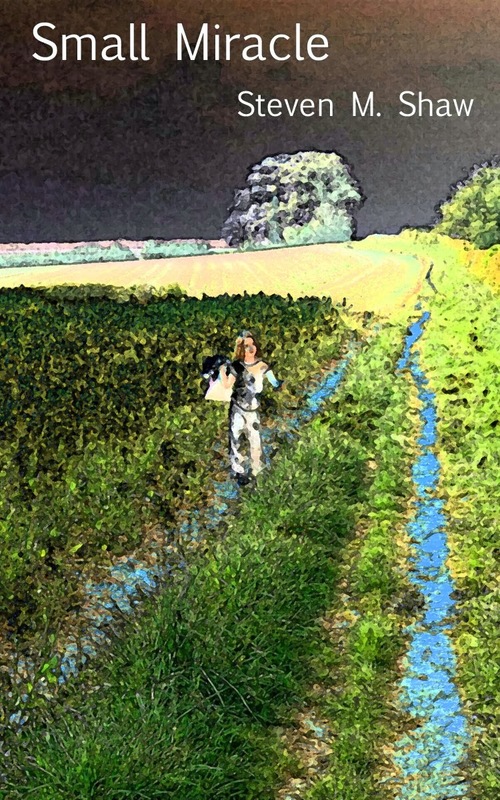 Three disparate groups get caught up in the ensuing mayhem, cross paths and try to survive. It could easily happen. If the premise sounds simple the delivery is anything but. Zombie Self-Defence force is a tour-de-force of madcap, over-the-top, total top drawer nonsense film making. Tomomatsu has recognised the inherent ludicrousness and absurdity of the zombie and just run with it, fully capturing the essence of what makes such great audaciously stupid gore comedies such Dead Alive or Evil Dead II, work, albeit on a smaller, cheaper scale. Never afraid he might be going to far and never stopping to show restraint he's produced a film so intrinsically bad one will either love or loath it. It'll be either, turn it off with a shake of the head before the opening sequence has passed, or do what I did and get with the program, and join in with the laughs. It really is a stupid film. Zombies, zombie embryo/babies, aliens, ancient spirits of world war 2 heroes, cyborgs; it's got it all. At heart though it is still a zombie film, and Tomomatsu demonstrates respect to the medium throughout, poking fun at the absurdity of the subject rather than the subject itself, and it's this which allows it all to work. However ludicrous the story gets or how stupid the action, the cohesiveness of it all stays tight and the central vision and gusto of the film stays on point. Of course with such a so-bad-it's-good story you need an accompanying range of exaggerated characters. Whether it's the small rather sensible Japanese defence force, the prima donna Idol Hitomi (Mihiro Taniguchi), the camp Yakuza, or the quite insane adulterer and homeowner the group find themselves huddled up with, they're all pitched and played to perfect b-movie perfection. The zombies are proper reanimates. 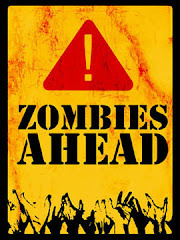 They can be momentarily stopped with headshots but whether their head's been removed or their brains have been shot out they'll soon be back up and back on the trail for flesh. Despite the low budget Tomomatsu has taken every care to make them appear gruesome, gratuitous, comical and most importantly authentic as possible and they actually come across well. He's also made clever use of speeding and slowing up the film to make their movements appear spasmodic, jagged, and unnatural; and it's all quite effective. Never one to avoid a joke, and never one to avoid a little zombie-fan service the film is full of subtle in-jokes and references to the rich zombie cinematic back catalogue with many scenes the direct parody of fan favourites. It's also never afraid to go truly over the top with the blood and gore in the ever increasingly gratuitous fights and deaths in true Dead Alive style. Demonstrating inventiveness and an eye for the absurd the blood always sprays a little too much and the deaths can be feel a contrived and set-up but it all adds to the experience. I've come to always expect a little titillation and fan service with my Japanese horror these days and it doesn't disappoint though, and this is with great relief, here it's actually quite restrained and if anything a little parodied itself. 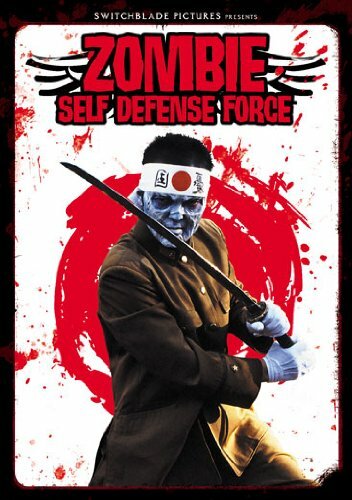 Zombie Self-Defence force will either be a film you love or hate; you'll either get the joke or be appalled by it. A proper Friday night, couple of cans of beer, leave the brain-at-the-door experience; it's a truly atrocious zombie film but one choc full of fun and charm. I honestly can't remember laughing this hard for a while though I'm still not totally sure whether this was at it or with it. Crass and tasteless; a stupid, STUPID film I totally admire, 7/10.